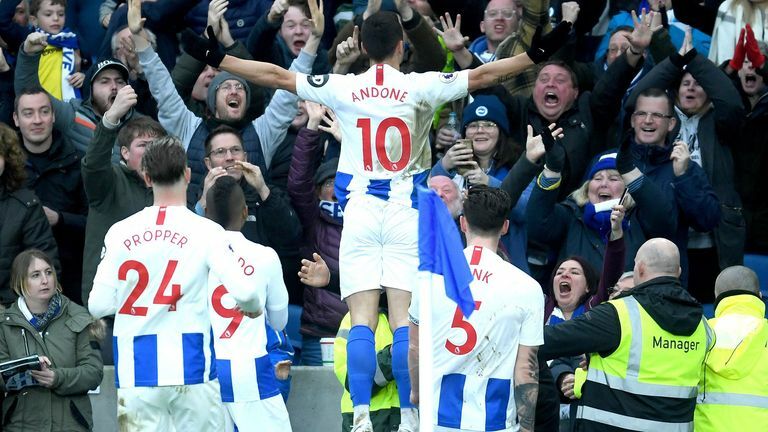 Brighton won their first game of 2019 after narrowly overcoming Premier League strugglers Huddersfield 1-0 at the Amex Stadium on Saturday. Substitute Florin Andone's close-range header in the 79th minute proved the difference to end the hosts' seven-game winless streak. Brighton came close to scoring in the first half through Alireza Jahanbakhsh, but his effort cracked off the crossbar. In the second half, Andone was denied by a fine stop from Jonas Lossl seven minutes before he scored the game's only goal. A deserved victory for Chris Hughton's side means they sit in 15th on 30 points. Huddersfield lie in 20th, 13 points off safety with nine games of the season to go. In a cagey opening half, the first shot on target did not arrive until the 30th-minute mark when Alex Pritchard's swerving effort from the edge of the box was fumbled by Mathew Ryan, before he quickly punched away the loose ball to deny a rebound. Seven minutes later and Jahanbakhsh produced the best chance of the half, but the crossbar denied the Iran international his first Premier League goal after he sweetly struck a dipping effort from a tight angle. Juninho Bacuna, who impressed while playing in an unfamiliar right-back position, had a long-range attempt on goal of his own on the stroke of half-time, but Ryan got down to parry away the 21-year-old's driven shot. Bernardo, Yves Bissouma and Alireza Jahanbakhsh came in for Gaetan Bong, Solly March and Pascal Gross (injured). 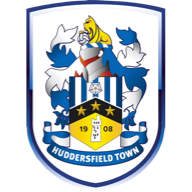 For Huddersfield, Demeaco Duhaney (injured) dropped out for Juninho Bacuna. 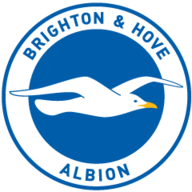 Glenn Murray was presented with a good opportunity to break the deadlock in the 52nd minute as Brighton pushed more men forward, but Bacuna slid in to make a vital block before he could get a goal-bound effort away from six-yards out. Six minutes later and Jahanbakhsh came close again, but Lossl denied him at the near post. In the 70th minute, the Swiss goalkeeper was called into action once more to bat away a ferocious effort on goal from Andone with a strong right hand. Finally, 12 minutes from time, Brighton got the goal - and the three points - they deserved through Andone, who nodded in Anthony Knockaert's dangerous cross from point-blank range. 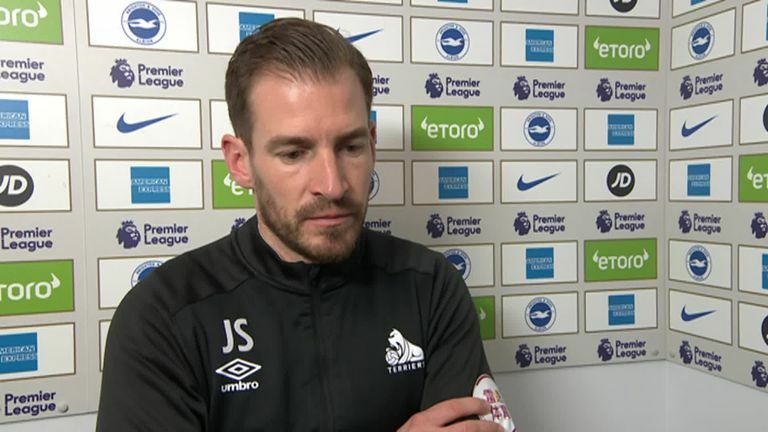 Brighton's win ended a run of seven Premier League games without a victory (D2 L5). Huddersfield have played seven league matches against Brighton at the Amex Stadium without winning, more than any other side. Brighton are unbeaten in seven home league meetings with Huddersfield Town (W4 D3 L0) since a 2-3 defeat in League One in April 2011. Huddersfield have lost 14 of their last 16 Premier League games (W1 D1). Only Derby in 07/08 (14) scored fewer goals after 29 games of a Premier League season than Huddersfield in 2018-19 (15). Anthony Knockaert has registered two assists in his last three Premier League games for Brighton, after managing just one in his last 15 before that. 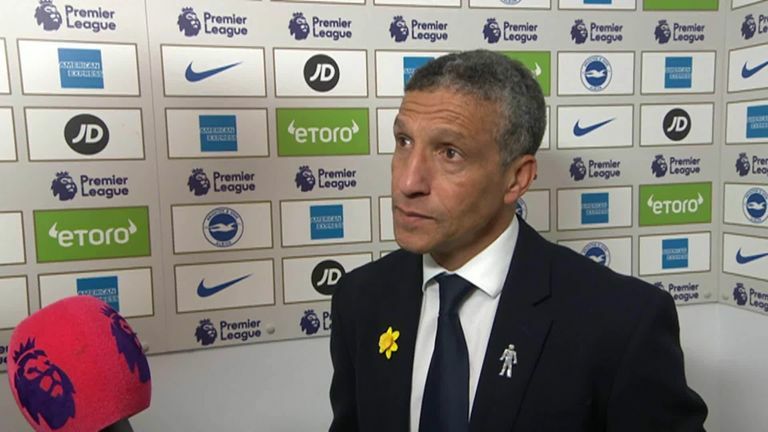 Chris Hughton: "It feels like a big win. Every win we will have from now until the end of the season will feel like one but particularly in the run that we've had. "We've been unfortunate at times and today was a bit similar to the type of games we've had. You need those moments to go for you. We had that with the goal. "We should have had the moment with the penalty appeal but I think we got our margins right today." Jan Siewert: "We lost the game because of a free-kick. "Although I knew that it would be hard because of the Wolves game where everybody emptied the tank, everybody was fighting but we lost the game in one situation. "We were not switched on and the free-kick killed us today." Andone replaced a largely-disappointing Glenn Murray in the 57th minute and he made a game-changing impact in a short space of time. He forced Lossl into making a great save in the 70th minute; nine minutes before scoring the game-winning goal. In the 83rd minute Brighton arguably should have had a penalty when the Romania international was bundled over in the box by Terence Kongolo as the former Deportivo striker continually caused the Huddersfield backline problems. Brighton travel to Selhurst Park to take on Crystal Palace on Saturday, March 9 - live on Sky Sports Premier League. Huddersfield host Bournemouth on the same day.